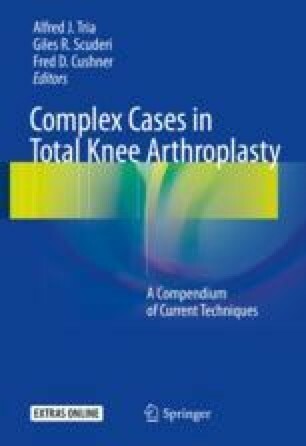 Rupture of the patella tendon during or following total knee arthroplasty (TKA) can be an extremely challenging complication to manage. The following case reports will describe several surgical options for the management of patella tendon ruptures, but it is important to identify those patients who are at greater risk for rupture of the patella tendon. Those patients at higher risk tend to be obese, have limited preoperative range of motion, have had prior surgery, or have a metabolic condition or connective tissue disorder that may compromise the patella tendon.